The atom bomb dropped on Hiroshima, Japan on August 6, 1945. At this time, Sadako was two years old. The story begins eleven years later. Sadako wakes up energetic and excited because she enjoys the celebrations of Peace Day. Sadako loves to run. Her goal is to make the race team in junior high school. She practices daily, but notices that she often feels dizzy after running. In early autumn, Sadako collapses. At the hospital, her family learns that she has leukemia. The radiation poisoning from the atom bomb caused the illness. Sadako’s best friend brings paper to the hospital. She shows Sadako how to make paper cranes. The legend says that if a person makes 1000 cranes, the person is granted a wish. Sadako begins making cranes as she fights the sickness. As Sadako struggles to get better, she meets another boy who has leukemia. He dies. Sadako appears to be getting better. She goes home to celebrate OBon. Sadako relapses and must return to the hospital. She dies October 25, 1955. 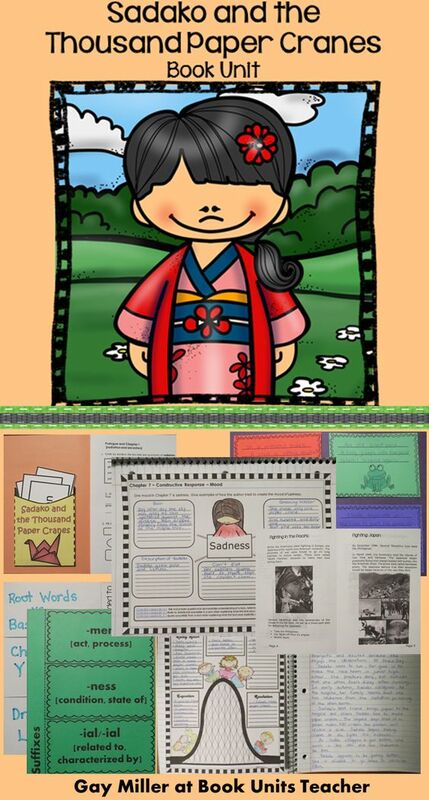 This free resource contains three pyramid organizers plus answer keys: one each for Sadako, Chizuko, and a blank organizer that can be used for any character. Students write physical characters on one triangle, inner traits on one triangle, and color/draw the character on the third triangle. Students use the information from the triangles to complete the Venn Diagram. Download the free materials here. Do you need additional teaching resources? Check out Sadako and the Thousand Paper Cranes at Teachers pay Teachers.